Photo is of my home in Superior, built in 1900 and getting as much rehab as I can do in 2019 and beyond. Note the amount of insulation. In an attempt to address energy efficiency, the Minneapolis City Council is poised to consider adding new burdens on the sale of residential homes. Specifically, a blower-door test and a two-inch hole drilled on the inside of an exterior wall would tell prospective buyers new information about the home they are purchasing. If implemented, I worry that this will lead to more difficult real estate transactions, lower home values, and possibly even a net loss in energy output. 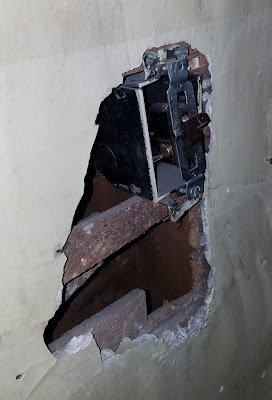 While my time living in Minneapolis has drawn to a close and my time owning property there also nears an end, that doesn't mean my connection to the city is severed and never to be restored. A future job, relationship, or investment opportunity could always take me back to the Twin Cities at some point. And a regulation like this would make me less likely to make that investment in this fair city. ...I like old houses. More specifically, I like to find older homes that need a lot of work but once that work is done the restoration really makes the house and the community shine. The last two homes I have bought were like this, and if I buy another while I'm able, I want to keep on bringing these places back to their former and future glory. The picture at the head of this article is from my new home in Superior as I do major work on the walls. The house was built in 1900 and I didn't need an energy audit to tell me that there was little to no insulation. I'm also unlikely to add insulation unless I'm in this property for decades to come, because just about every square inch inside and out already needs my time and money. So a report like the one proposed wouldn't tell me anything I already didn't know or assume about the kinds of houses I'm likely to buy. For my Minneapolis home, Greater Metropolitan Housing Corp did the rehab work and definitely lost money on the deal (although as a housing non-profit, losing money to restore or provide housing is kind of their mission). Knowing what I know now, I might have been able to do much the work myself and break even. Which is the plan for my new home in Superior. From the foundation to the roof, from the electric and plumbing systems to the mechanicals, the floors and interior walls, and new paint on the exterior, there isn't a square inch of the house that doesn't need something done. My goal is to break even on the acquisition and repair items in terms of the current market value, so that over time the property breaks even like a more traditional purchase. If I had to add in the cost of insulation - not because I wanted it, but because I would anticipate that a future buyer would do this required test and then expect it - those numbers become even tighter and make a similar purchase in Minneapolis less likely. Then a house like this would be likelier to either be demolished or fall into the hands of an unscrupulous investor who would treat it with far less care than a buyer like myself. And the greenest house is the one that's already built, so demolition for the sake of energy efficiency is the height of foolishness. Buyers like me are out there and we perform an important role in the housing market. But we're a small enough subset that it's possible a policy wouldn't be good for us even as it makes sense on a broader scale. Unfortunately, that's not the case here. TISH inspectors aren't insured to drill into walls. What happens if asbestos or vermiculite dust falls out of the hole? Will that trigger additional required repairs? How will dust be contained? What happens if drilling hits a wire or causes other system damage? What happens if an owner objects to the drilling or insists that the drill happen in a different place than the inspector would choose? How would an inspector, buyer, or real estate agent know whether the results of the drilling - whether good or bad - are consistent throughout the property? Much of the focus is on the two-inch hole drilling, but the impacts of blower door testing shouldn't be ignored either. Industry professionals have estimated that adding that test to the pre-sale inspection could effectively double the cost. Not every inspector currently has the blower door test equipment, so the need to acquire the tools, then learn and implement the test are going to be passed on to the consumer. Likewise, the additional insurance risks for drilling will factor into costs. Through discussions with the inspectors during the pilot and in the focus group, it became apparent that the enhanced inspection was beyond the scope of their inspections. One inspector saw this as a market differentiator, but it was unclear if clients would be willing to pay for this. For most inspectors their buyer’s inspection is already four hours long, so adding something significant to the scope would need to be justified by a large cost. Inspectors were also hesitant to ‘go down the rabbit hole’ of a detailed energy assessment, as they realize the complexities of these recommendations and how they affect the whole home. Inspectors reported that collecting the basic inspection data fit well within their inspection process, so it added little time to their inspections. The part of the pilot that required the most work for the inspectors was recording this data on a paper form and emailing it to CEE. This added some time in the field, but it was more of an administrative burden for the inspectors. If this burden were reduced this data could be provided at a relatively low cost. As stated previously, the inspectors did not think the extra effort and training required for the enhanced inspection justified the cost. Inspectors received $50 more for these inspections, which required an average of 30 additional minutes on-site. We thought some inspectors would be interested in learning this skill, but that proved to be untrue. The enhanced inspection proved to be beyond the scope of the inspection process. This inspection was closer to an energy audit and the majority of the inspectors did not see the value of adding this to their inspection process. They do not want to compete with the energy audit offerings, as they are highly subsidized, and would rather refer their clients to an energy audit when applicable. The financial impact on sellers shouldn't be overlooked either. It's easy to think that even with a doubled or tripled inspection cost, the seller is going to have the money for that expense. But TISH inspections are paid up front, not at closing. And in today's economy the average person can't cover a $400 emergency expense. Even if the inspection fee is put on a credit card or collected at closing, let's remember that not too long ago we had a little bit of a hiccup in the housing market. If a seller is breaking even or even bringing cash to the closing, these costs become very real. Hell, they can be barriers in a hot market too, if a seller needs every penny just to move on to their next home. I'm sure other realtors and lenders can remember transactions like this, but as a former mortgage lender I can recount my fair share of closings where an additional $400 cost on either side of the transaction would have caused a deal to fall apart. If spending, let's say, $5,000 on insulation and energy upgrades gets me $5,000 or more in return on that investment - either energy savings over time or in direct resale value - then the regulatory sting becomes more palatable. But then it's not making housing any cheaper for a new buyer and as an existing owner I'd still have to be able to shoulder that burden. Even if the market value isn't quite there, I do agree with the premise that combating climate change is going to require some sacrifices. We're not going to make an impact on global warming just by doing things voluntarily and at minimal cost. So there are ways to measure the financial costs weighed against the environmental gains to decide if a new policy is beneficial even in the face of widespread industry protest. Unfortunately, that's not what I see this council doing. Instead, it seems like the modus operandi is to operate from a predetermined ideological conclusion (climate change requires us to act), and work backwards from there (of COURSE certain people will be opposed) to retcon a justification for the new policy that would be enacted regardless of community input or evidentiary findings. The basic updates to these disclosures provide a clear benefit at a minimal cost. The enhanced changes would be better implemented with incentives instead of requirements.